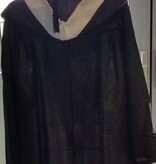 This includes a one-size-fits-all cap, a gown and a current tassel. Sizing is based primarily on your height. If your height happens to be sold out, it is better to order the next size up. Plus sizing is available for weights exceeding 200 lbs. A Bachelor's hood is also required but is sold separately. All graduation regalia is nonreturnable.